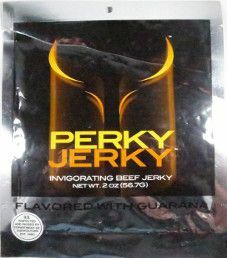 This review will focus on a 2.2 ounce/62.4 gram bag of Perky Jerky original flavored beef jerky. This bag was kindly submitted by the Perky Jerky team. Note: For a recent, live taste review, open Perky Jerky – Original Beef Jerky (Recipe #2). 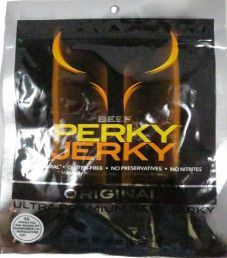 This review will focus on a 2 ounce/56.7 gram bag of Perky Jerky original flavored beef jerky. This bag was purchased at a 7-Eleven store in Kearny, New Jersey, back in 2010.